Buffalo-NiagaraGardening.com > Garden tips > Learn the secret of this award-winning container– It lasts from spring to winter! Learn the secret of this award-winning container– It lasts from spring to winter! Here’s a great container called “Winter Green” created by Mark Yadon of Mischler’s Florist and Greenhouses, 118 South Forest Rd., Williamsville. You can plant up a container like this in spring and enjoy it throughout summer, autumn and even into winter. Of course, the gardening season doesn’t end with Labor Day, and you can still plant up a container like this right now. Plus, perennials are on sale! This is also a great project for those people who claim they have no room to garden. If you attended Yadon’s demonstration at the Lewiston GardenFest in the third week of June this year, you saw him plant up this container. It’s not particularly hard to do; it took him about 20 minutes. It’s the clever choice of plants in this arrangement that sets this creation apart. 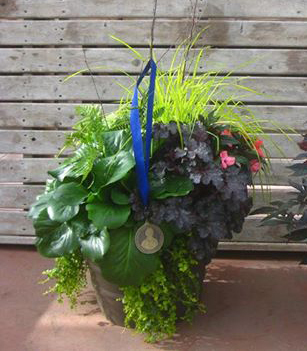 The same container that he planted at the Lewiston Garden Fest was recognized Aug. 5 at Cornell University’s Floriculture Field Day with a first-place prize in the Kathy Pufahl Container Competition. Yadon also won third place in the same category, which was for 16-inch pots. 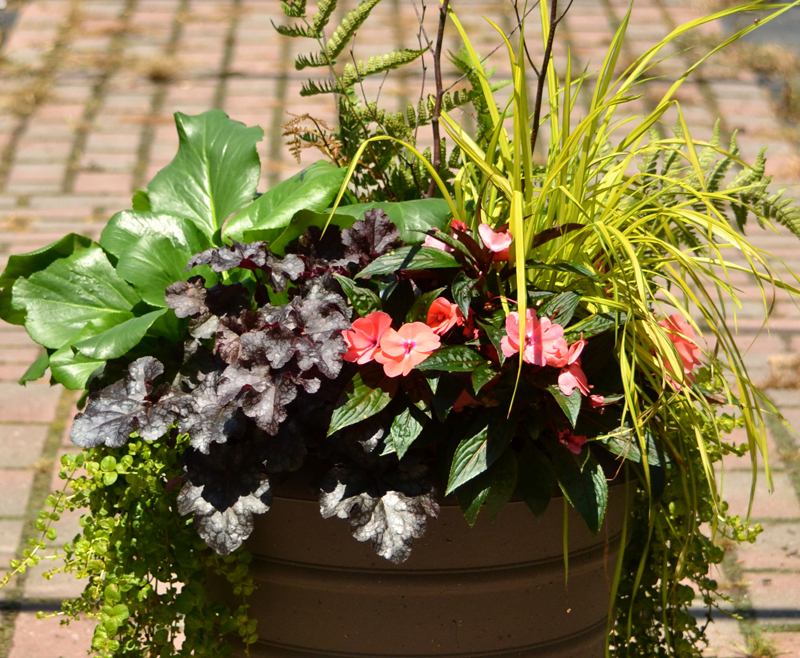 The first thing you need to know about this container is that most of the plants in this pot are perennials. The other important point to remember in this design is that most of the plants are evergreen. “They will keep their color after the first frost and well into winter,” Yadon said. A yellowish grass at the top called carex ‘Bowles Golden’. Lysimachia ‘Aurea’ or creeping jenny. It has tiny, yellow-green leaves and trails down the side of the container. Bergenia or pigsqueak, which gets spring flowers. It gets the name “pigsqueak” because when you rub the leaf, it makes a squeaking sound. 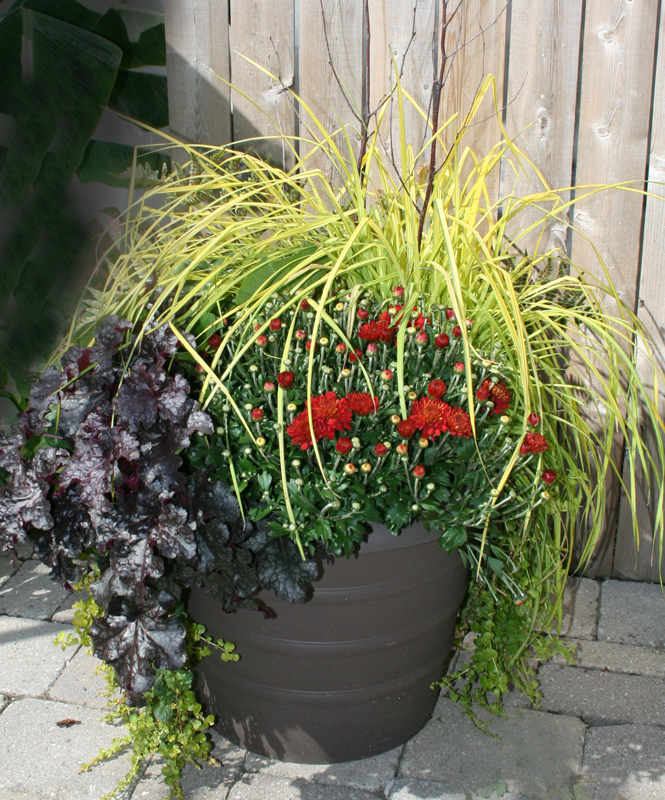 The container enters autumn with a mum in place of the New Guinea impatiens. Photo courtesy Mischler’s Florist and Greenhouses. Some people want to see more flowers, so Yadon designed the container with space for a showy plant that can be changed out as the season demands. Before the frost hits, the New Guinea impatiens can be pulled out and a mum popped in its place. As we move into winter, pull out the mum and insert pine boughs, pine cones and red ribbon. 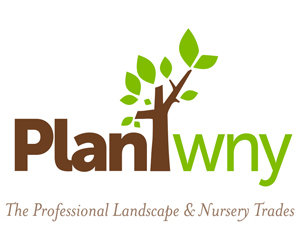 Even though the planting will eventually lose its luster, you don’t have to throw the plants out. Keep watering the container through November. When it no longer looks nice, place the pot in a sheltered area where it won’t get rained on or snowed on, such as under an eave, under an awning or in an unheated garage. If we get a thaw in January, water the container once. If we don’t get a thaw in January, water the container once in February. While in theory you could keep this container for years, at some point you may find that your container is overgrown. Remember that these plants are perennials, and they will get bigger and spread out. If the plants are overgrown, Yadon doesn’t recommend trimming them. Instead, he suggests taking the container apart and finding new homes for the plants. Start over in the container with new plants. That’s such a good explanation of “how to”. I saw similar containers in Fine Gardening, but the plants shown above are more normally available locally. I’m going to give it a try next season. Sue, you’re right. The key to making this container is knowing what plants will work in our area. Let us know how your container works next year!